How does this work? Click to learn more! 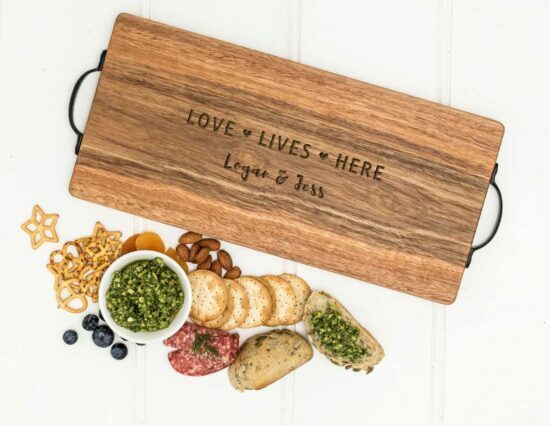 This Personalised Arrow Heart Charcuterie Board is the perfect little sentiment for the happy couple! 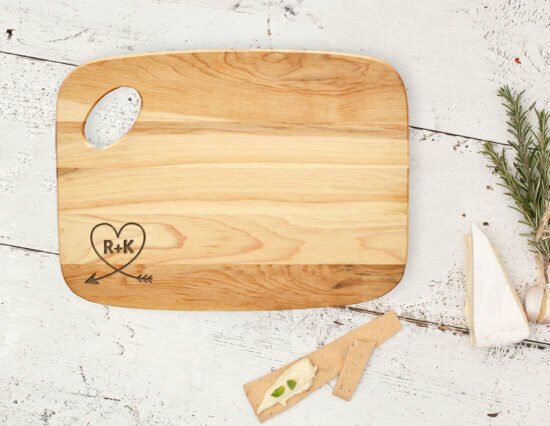 Whether as an engagement gift, anniversary gift or even a housewarming gift, it’s the perfect dining accessory for serving up an arrangement of meats and accompaniments, such as fruit, cheese and sauces. 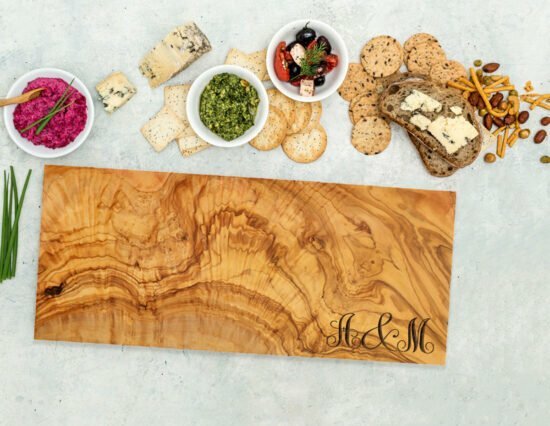 You can personalise this charcuterie board to reflect their first initials by using the personalisation fields located above. Engraving Disclaimer: Timber is a natural product, which varies in terms of grain and colour, and every engraving will produce differently. For the purpose of sale, the primary image of this product is a computer-generated mock-up. Engravings will adopt the characteristics of the timber, and will not always be a solid or consistent block of colour. We have a one day turnaround time, meaning orders are made and shipped either same business day, or next business day. Delivery time is dependent on your location and the shipping method selected (Standard shipping or Express shipping). For a more comprehensive guide, please visit the Delivery Enquiries section of our Help Centre. 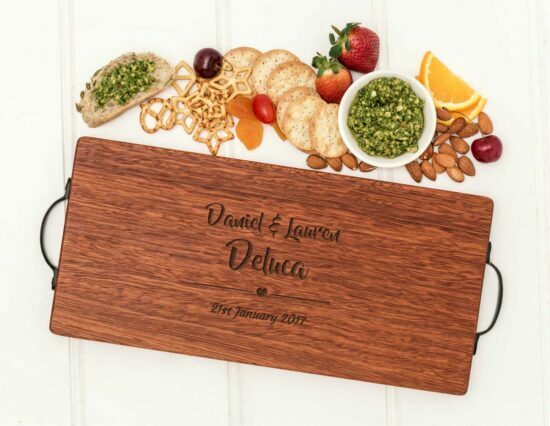 We provide the option to engrave a short message on the back of the board. All messages are engraved in the centre of the back of the board in a standard font and size (Lato Font / 22pt to 32pt depending on the size of the board). This message can be a maximum 300 characters in length. This product is made in Canada from Canadian Maple timbers. Canadian Maple is a hardwood timber which is generally light in colouring, used commonly for furniture, flooring and wood working. 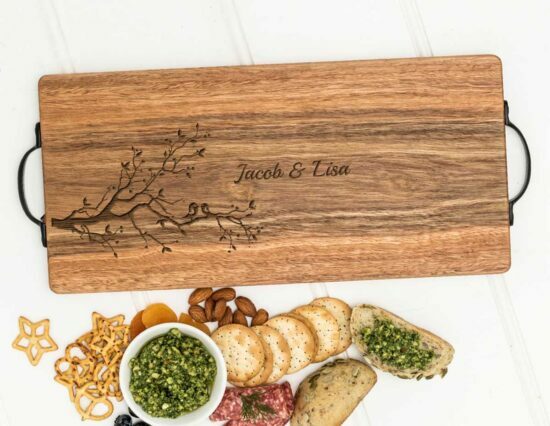 This charcuterie board measures 30.5cm x 23cm round, with a 6cm wide handle/hanging hole. It weighs approximately 800g. After use, wash your board with warm soapy water (preferably with a cloth) and wipe dry. Avoid soaking this product in water and do not put through the dishwasher under any circumstances. As time goes on, the surface of your board may become dry and fuzzy, particular if used regularly. We recommend applying Grapeseed Oil or Mineral Oil as the surface becomes dry or after each use. You may also use a fine piece of sand paper to very lightly sand over the board prior to re-oiling it. The designs that you find on our website are templates, and the details that you provide (for example, in the fields that say First Name, Second Name, etc), simply replace the details shown on the example. On this page, you will find personalisation fields where you can enter the details you'd like. Not all fields are required, and optional fields will be marked as such. 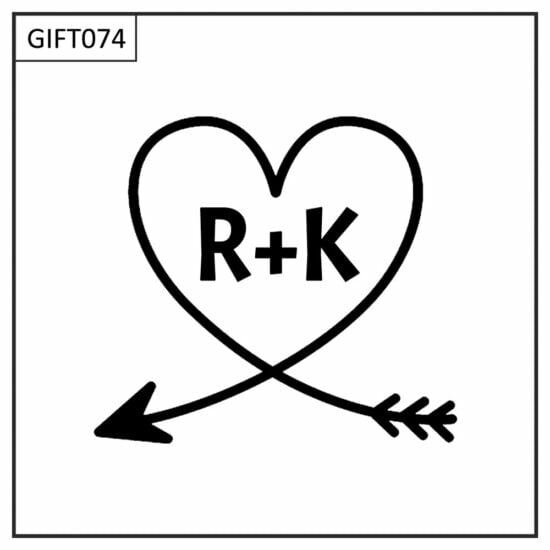 The design templates also extend to capitalisation; where you will see a design all in capitals, even if you provide the details in lower case, it will be engraved in capitals (and vice versa). Unless we are given specific instructions during checkout in the Order Notes section, or are contacted before or after the order is placed, the board is made exactly according to the template. Not all fonts are available in both capital and lower case letters, so bear in mind, it may not always be possible to fulfil your request. Every design is customisable, and we offer design changes or custom designs at no additional charge! 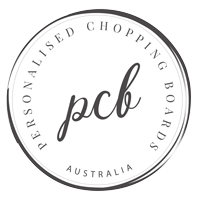 If you have a design change request and would like to see a proof prior to ordering, please email our friendly staff at hello@personalisedchoppingboards.com.au. We will endeavour to return your email as soon as possible!